The two members of the Guyana Police Force, who were allegedly caught with five kilogrammes of marijuana that they had seized from a man, were Thursday charged with possession of narcotics for the purpose of trafficking. 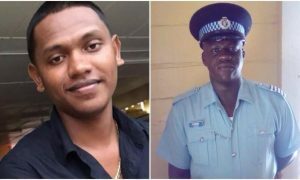 Whim Magistrate, Charlyn Artiga did not grant bail to Traffic Department Constables Bharat Shattarpaul, 28, of 47 Princeton, Corriverton and Delroy Fraser, 24 of Belladrum Village, West Coast Berbice. They were remanded to prison until December 30, 2016. The case would be sent to Chief Magistrate, Ann Mc Lennan for assignment to a court. Shattrarpaul’s lawyer, Chandra Sohan, made an unsuccessful bail application on the grounds that the policeman has been asthmatic for 10 years now. Sohan a;so argued that it would be risky to place his client in the same prison with persons he would have interacted with while executing his duties. Police Prosecutor, Phillip Sheriff opposed the bail application and succeeded in having the constables remanded to prison on the grounds that the offence was prevalent and the amount of marijuana allegedly found in their possession was large. In remanding Constables Shattarpaul and Fraser, she said the Shattarpaul’s asthmatic condition could be treated in prison. She ordered that the policemen be kept separately from prisoners to avoid them from coming into contact with inmates they would have dealt with as law enforcement agents. The constables were arrested after the compressed marijuana was found in a car owned by one of the policemen. A group of policemen, who were returning to Berbice on December 19, 2016 when they spotted and intercepted a car known to be involved in drug trafficking. The lawmen then escorted the car to the Berbice Bridge area where they allegedly held negotiations with the driver with the aim of releasing them from custody in exchange for a bribe. After the alleged talks broke down, the policemen allegedly transported the marijuana in a bus belonging to the Guyana Police Force. On arrival outside the New Amsterdam Central Police Station, the policemen allegedly placed the marijuana in a car belonging to one of them. A senior police officer later received a tip-off and a search uncovered the marijuana in the vehicle.